A grid with four slots defined by ‘display: "aaaaaaa" "bccccdd"’. CSS is a simple, declarative language for creating style sheets that specify the rendering of HTML and other structured documents. This module contains CSS features to describe layouts at a high level, meant for tasks such as the positioning and alignment of “widgets” in a graphical user interface or the layout grid for a page or a window. A layout grid or “template” defines one or more “slots” that an element's content can flow into. This allows elements to have complex shapes and it allows the visual order to be different from the order of the elements in the source document. A ‘::slot’ selector allows elements to be styled differently based on which slot they appear in. This draft is related to the drafts about positoning with grid units (‘fr’), creating and naming grids and regions [CSS3-GRID-LAYOUT], flexible GUIs [CSS3-FLEXBOX], and tables [CSS3TBL]. The CSS Working Group is considering combining some or all of these into a single specification with all matrix-based layouts. The section on “CR exit criteria” lists some conditions for this specification to become a W3C Recommendation. CSS syntax module [CSS3SYN] – interactive vs non-interactive media. CSS values and Units module [CSS3VAL] – <string> and <length>. CSS paged media [CSS3PAGE] – properties page-break-before, page-break-after and page; page area (in particular its width & height). CSS background and borders [CSS3BG] – property background and box-shadow? CSS Multi-column Layout Module [CSS3COL] – properties break-before, break-after and break-inside. Add to the above all the properties that are allowed on slots (see “The ‘::slot()’ pseudo-element”). See section 1.4.2 of CSS level 2 [CSS21] for the grammar and other notations that this specification uses in property definitions. The styling of a Web page, a form or a graphical user interface can roughly be divided in two parts: (1) defining the overall “grid” of the page or window and (2) specifying the fonts, indents, colors, etc., of the text and other objects. The two are not completely separate, of course, because indenting or coloring a text influences the perceived grid as well. Nevertheless, when one separates the parts of a style that should change when the window gets bigger from the parts that stay the same, one often finds that the grid changes (room for a sidebar, extra navigation bar, big margins, larger images…), while fonts, colors, indents, numbering styles, and many other things don't have to change, until the size of the window becomes extreme. The properties in this specification work by associating a layout policy with an element. Rather than letting an element lay out its descendants in their normal order as inline text or as blocks of text (the policies available in CSS level 1), the policy defined in this module, called template-based positioning, gives an element an invisible grid for aligning descendant elements. Because layouts on the Web have to adapt to different window and paper sizes, the rows and columns of the grid can be made fixed or flexible in size. Complex Web pages, with multiple navigation bars in fixed positions, areas for advertisements, etc. Complex forms, where the alignment of labels and form fields may be easier with the properties of this module than with the properties for tables and margins. GUIs, where buttons, toolbars, labels, icons, etc., are aligned in complex ways and have to stay aligned (and not wrap, for example) when the window is resized. Paged displays (e.g., printed media) where each page is divided in fixed areas for different kinds of content. 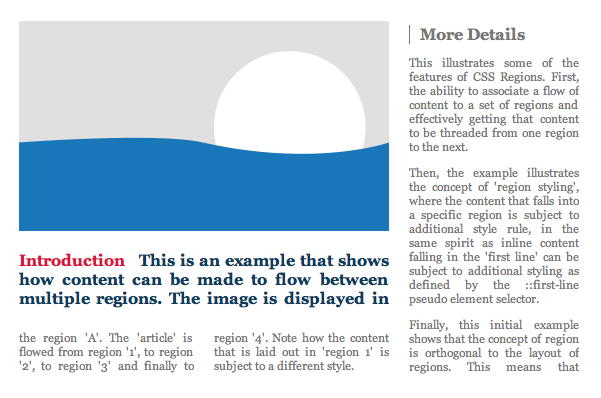 Complex pages with multiple regions, where the style of the text does not only depend on the type of element it comes from, but also on the region it is displayed in. Template-based positioning is an alternative to absolute positioning, which, like absolute positioning, is especially useful for aligning elements that don't have simple relationships in the source (parent-child, ancestor-descendant, immediate sibling). But in contrast to absolute positioning, the elements are not positioned with the help of horizontal and vertical coordinates, but by mapping them into slots in a table-like template. The relative size and alignment of elements is thus governed implicitly by the rows and columns of the template. A template doesn't allow elements to overlap, but it provides layouts that adapt better to different widths. Call it a “slot” or rather a “region”? The mapping is done with the ‘position’ property, which specifies in this case into which slot of the template the element goes. The template itself is specified on the ‘display’ property of some ancestor of the elements to remap. Each element occupies one slot. In this template, all slots have the same size. Templates can also help with device-independence. This example uses Media Queries [MEDIAQ] to change the overall layout of a page from 3-column layout for a wide screen to a 1-column layout for a narrow screen. It assumes the page has been marked-up with logical sections with IDs. We can lay it out as three columns, as the following illustrations show. The style sheet would contain the following. Example of rendering with a table. Example of rendering with equal columns. Example of rendering with a fixed third column and the other two columns of equal width. If there is an unknown number of columns (children of the div.group element), the style sheet for the table model will automatically take them into account. The style sheet for the template model, however, creates a template of exactly three columns and can't handle tables with an unknown number of columns. The extra elements will be added into the default slot (in this case the ‘a’ slot). Example of rendering with the contents of the three columns reversed: the third element is shown in the first slot and the first element in the third slot. In the table model, the order of the rows and columns is given by the document source and thus can't be changed. manon.</span> of The Rollow Carpug mentizes a costernica. Rendering of a text with footnotes. This example shows the use of chained regions: text from region 1 continues in region 2, 3 and 4. And it shows how to use pseudo-elements to style text in a particular region: text in region 1 is bigger than in other regions. The style sheet makes the DIV into a template element with five regions, called A, 1, 2, 3 and 4. The regions are grouped into two chains: region A on its own, and the chain consisting of 1, 2, 3 and 4. A number of features that are related to grid layouts are not handled in this module. Some of them are in other modules. The templates defined by this specification have a fixed number of slots, independent of the amount of content or the number of child elements. In some situations it may be useful to define a template and then, in the case there is more content than fits, automatically create new copies of the template, to the side of or below the first one, just like new pages are created in paged media or new columns in multi-column layouts. In some cases it may be possible to simulate that behavior by putting the template element inside a column layout. This specification allows to chain multiple slots together to form complex shapes, but each of the slots is itself still rectangular. Another module, CSS exclusions and shapes [CSS3-EXCLUSIONS], is expected to allow floating elements to have non-rectangular shapes and allow positioned elements to cause wrap-around. ISSUE-123: One way to experiment safely with implementations before the specification reaches Candidate Recommendation status is to add an identifier with a vendor prefix somewhere in the value, e.g., ‘display: -my-product "aa" "bc"’ or ‘display: -my-product("aa" "bc")’. A value of this form is called a template. An element with such a ‘display’ value is similar to a table element, in that its content is laid out in rows and columns. The two main differences are that the number of rows and columns doesn't depend on the content, but is fixed by the value of the property; and that the order of the descendants in the source document may be different from the order in which they appear in the rendered template. The <display-type> is one of the following keywords. An omitted keyword is equivalent to ‘block’. These three values are equivalent. The element is an inline-level element. The element is formatted as a list item. If the element has the value ‘inside’ for its ‘list-style-position’, that ‘inside’ is treated as if it were ‘outside’. These two values are equivalent. This creates a principal block-level box that is the template, with around it an anonymous ‘table-row’ box and around it a box of the indicated type. Around it may be more anonymous boxes according to the rules for Anonymous table objects [CSS21]. This creates a principal block-level box that is the template and around it a ‘table-row’ box. Around it may be zero or more anonymous boxes according to the rules for Anonymous table objects [CSS21]. The template is ignored and the element is treated as an element of the indicated type. The element is a table cell with a template. The element is a table caption with a template. The template is ignored and the element is treated as for ‘display: none’. Future display types added in other modules? Note that ‘display’ is extended to apply to ‘@page’ rules as well and that it has a different default there, viz., ‘"@"’. See “Templates in paged media” below. Each string consist of one or more at signs (“@”), letters (or digits, see <letter> below), periods (“.”) and spaces. Each string represents one row in the template, each character other than a space represents one column in that row. Spaces have no meaning. They may be added for readability. (at sign) default slot for content. Multiple identical letters in adjacent rows or columns form a single slot that spans those rows and columns. Ditto for multiple “@”s. Uppercase and lowercase are considered to be the same letter (i.e., the template is case-insensitive). Non-rectangular slots and multiple slots with the same letter are illegal. A template without any letter or “@” is illegal. A template with more than one “@” slot is illegal. These errors cause the declaration to be ignored. 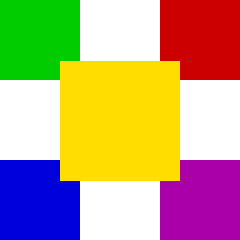 Note: non-rectangular and disconnected regions may be permitted in a future update of CSS. Rows with fewer columns than other rows are implicitly padded with periods (“.”) (that will thus not contain any elements). Each slot (letter or “@”) acts as a block element for its contents. An explicit height for that row. Negative values make the template illegal. If the length is expressed in ‘gr’ units, these refer to the inherited grid, not the grid defined by the template itself (see “Definition of the ‘gr’ unit in a template element”). The row's height is determined by its contents. See the algorithm below. (asterisk) All rows with an asterisk will be of equal height. See the algorithm below. An explicit width for that column. Negative values make the template illegal. (asterisk.) All columns with a ‘*’ have the same width. See the algorithm below. The column's width is determined by its contents. See the algorithm below. The column's width is constrained to be greater than or equal to p and less than or equal to q. p and q stand for [ <length> | max-content | min-content | * ]. There may be white space around the p and q. If q < p, then q is ignored and ‘minmax(p,q)’ is treated as ‘minmax(p,p)’. Note that it is legal to specify no widths at all. In that case, all columns have the same width. The orientation of the template is independent of the writing mode (‘direction’ and ‘block-flow’ properties): the first string is the topmost row and the first symbol in each string is the leftmost column. if the element has ‘position: fixed’, ‘position: absolute’, a value of ‘float’ that is not ‘none’ or the element is the root element, than it has no template ancestor. else, if the element's parent has a template as its ‘display’, then that parent is the element's template ancestor. else, the element's template ancestor is the same as its parent's template ancestor. A column with a <col-width> of a given <length> has intrinsic minimum and intrinsic preferred widths both equal to that <length>. A column with a <col-width> of ‘*’ has an infinite intrinsic preferred width. Its intrinsic minimum width is 0. The intrinsic minimum width of a “.” is 0. The intrinsic minimum width of a letter or “@” is 0 if that slot spans two or more columns; otherwise, it is the intrinsic minimum width as defined by [CSS3BOX]. For the purpose of that definition, the slot is considered as a block with a ‘block-flow’ of ‘tb’ with its contents as its children. Should the block progression direction be a property? The intrinsic preferred width of a “.” is 0. The intrinsic preferred width of a letter or “@” is the intrinsic preferred width as defined by [CSS3BOX]. For the purpose of that definition, the slot (which may span several columns) is considered as a block with a ‘block-flow’ of ‘tb’ with its contents as its children. Should the block progression direction be a property? A column with a <col-width> of ‘minmax(p,q)’ has an intrinsic minimum width equal to p and an intrinsic preferred width equal to q. 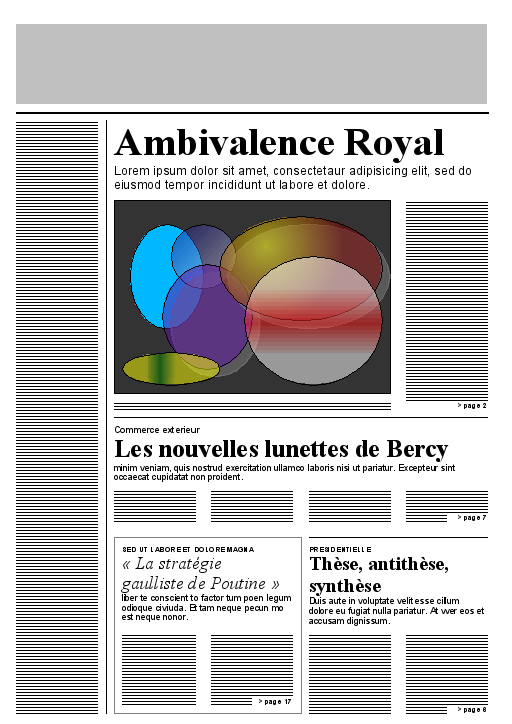 Next, the layout algorithm distinguishes between elements with and without an a-priori known content width. The width isn't known a-priori, if, e.g., ‘width’ is ‘auto’ and the element is floating, absolutely positioned, inline-block or a child of a block with vertical writing mode. If the sum of the intrinsic minimum widths of the columns is larger than the element's width, each column is set to its intrinsic minimum width and the contents will overflow (see ‘overflow’). If the sum of the intrinsic minimum widths of the columns is less than or equal to the element's width, the columns are widened until the total width is equal to the element's width, as follows: all columns get the same width, except that no column or span of columns may be wider than its intrinsic preferred width. If the columns cannot be widened enough, the template is left or right aligned in the element's content area, depending on whether ‘direction’ is ‘ltr’ or ‘rtl’, respectively. If the sum of the intrinsic minimum widths of the columns is wider than the initial containing block, each column is set to its intrinsic minimum width. The element's used width is the sum of the widths of the columns. If the sum of the intrinsic minimum widths of the columns is less than or equal to the width of the initial containing block, the columns are widened until the total width is equal to the initial containing block, as follows: all columns get the same width, except that no column or span of columns may be wider than its maximum intrinsic width. The element's used width is the sum of the widths of the columns. An extra step may be necessary in paged media if a page break occurs inside a template (only in the case of an element-based template, see below). If the template, after computing the width and height, is too big to fit on the current page, and if a suitable break point exists, the part of the template after that break point is put on the next page. The width of the containing block on that page may be different if that page has different margins from the current page (see [CSS3PAGE]) and thus the width and height of that part of the template must be recalculated in the new context. Note that the widths of the columns can be completely determined before laying out any of the contents as long as there are no columns with a <col-width> of ‘min-content’ or ‘max-content’. Do we define restrictions or approximations for slots that are part of a chain to avoid complicated optimization algorithms? Rows with a height set to <length> have that height. No row has a negative height. All rows with a height set to ‘*’ are the same height. Every sequence of one or more rows of which at least one has a height set to ‘auto’ is at least as high as every letter or “@” slot that spans exactly that sequence of rows. If the computed value of the element's ‘height’ is ‘auto’, then every sequence of one or more rows of which at least one has a height set to ‘*’ is at least as high as every letter or “@” slot that spans exactly that sequence of rows. The whole template is at least as high as the computed value of the element's ‘height’, unless that value is ‘auto’, or unless all rows have a height set to <length>. If the template is higher than the element's ‘height’, the element overflows, see ‘overflow’. This may have multiple solutions in case the element has a fixed height that is larger than the sum of the minimum sizes of each row. Do all rows without a fixed <length> become taller by the same amount? or by the same percentage? or do rows with ‘auto’ only increase if there are no rows with ‘*’? Something like a box-flex-group property (and optionally a box-flex as well (see [CSS3-FLEXBOX]) can give the designer explicit control. The note below hints at that. Another option is to have ‘fill’ and ‘filll’ units as in TEX: calc(5em + 2fill). Note: In a future update of CSS, rows might get a property to specify how the height of that row is adjusted in case the above calculation yields a template that is less tall than the element itself. The height of a slot is measured as if the slot had one anonymous block as a child that contains all the slot's contents, and both the slot and the anonymous block have a ‘block-flow’ of ‘tb’ and the anonymous block's height is computed as a flow root (see “Auto heights for flow roots” in [CSS3BOX]). Roughly, this means the height is from the top margin edge of the topmost element to the bottom margin edge of the bottommost element or of the bottommost float. The intrinsic height of a ‘.’ slot is 0. This example divides the window in three rows and three columns, separated by 1em of white space. The middle row and the middle column are flexible, the others are fixed at a specific size. The first column is 5em wide, the last one 10em. One way to experiment safely with implementations before the specification reaches Candidate Recommendation status is to add an identifier with a vendor prefix somewhere in the value, e.g., ‘position: a -my-product’ or ‘position: -my-product(a)’. This value of the ‘position’ property specifies into which row and column of a template the element is placed. The <letter> must be a single letter or digit, with category Lu, Ll, Lt or Nd in Unicode [UNICODE]), or a “@” symbol. A value of ‘same’ computes to the same letter as the most recent element with a letter as computed value that has the same template ancestor. If there is no such element, the value computes to ‘static’. The containing block of an element with one of these values for ‘position’ is the slot in the template into which it is flowed. Multiple elements may be put into the same slot. They will be laid-out according to their ‘display’ property in the order they occur in the source document. The caption can be wider than the image and the image will be centered. The addition of ‘display: block’ causes the form controls to use the width computation of blocks, in other words: they will be as wide as their containing block, which in this case means that they will be as wide as the slot they are assigned to. Without it, they would be inline elements and just be left-aligned in their slots. Possible rendering of the example. This example shows that templates can be nested. The body has two columns. The #content element that goes into the second column has itself another template, into which the various “modules” are placed. For clarity, the inner template uses different letters for the slots than the outer template. This is not required. display: "c   .   d   .   e   "
".   .   f   .   .   "
This example shows the use of ‘same’ to put DD elements in the same slot as the preceding DT. Possible rendering of the DL list, with items sorted into three columns. The slots of a template element can be individually addressed with the ‘slot()’ pseudo-element. The selector ‘E::slot(X)’ selects the part of an element E that falls inside the slot with name X of a template T, where T is either the template of E itself (if E is a template element) or the template of the template ancestor of E. If there is no such template T, or if it does not contain a slot called X, the selector matches nothing. The following example shows the difference between using the ‘::slot()’ pseudo-element in combination with a template element and in combination with a descendant of such an element. Expand example with a screen shot. Only the following properties apply to the ‘slot()’ pseudo-element. Those marked with a * apply only to the ‘slot()’ pseudo-element of a template element. What is the text indent of a P that starts in slot a? 10pt or 20pt? The background of a slot is drawn immediately on top of the background of the element itself. E.g., the background set on ‘P::slot(a)’ is immediately in front of the background set on ‘P’. Need to define the width when a slot has padding and border, including when the width is too small. Note that slots can have borders and padding, but no margins (cf. table cells). The content of the slot is aligned to the bottom of the slot: the bottom margin edge of the anonymous block coincides with the bottom of the slot. The top margin edge of the anonymous block may not be higher than the top edge of the slot. The topmost baseline in the content may not be higher than the topmost baseline of content in any other slot in the same row that also has ‘vertical-align: baseline’. Baselines of content inside floats are not taken into account. Slots that span several rows are considered to occur in their topmost row. For all other values, the content is top aligned: the top margin edge of the anonymous box coincides with the top edge of the slot. A template can also be attached to a page, rather than an element. Such a template is called a page-based template as opposed to an element-based template. The difference between page-based layout templates and element-based ones is that the size of a slot in a page-based layout template only depends on the template and the page size, never on the intrinsic size of the content. Another difference is that content that overflows a slot may cause a page break: the rest of the content is put on another page. See below. The syntax of a page-based template is the same as that of an element-based one, but the declaration appears in an ‘@page’ rule and any <col-width> or <row-height> that is neither ‘*’ nor a <length> is treated as if it were ‘*’. Also, a <display-type> may be present, but has no effect. Although the occurrence of keywords, such as ‘fit-content’ or ‘auto’, is valid and well defined, a UA, especially an editor, may want to issue a warning, because those keywords don't have any useful function in page-based templates. The default ‘display’ value of a page is ‘display: "@"’. The height of the slots in a template is computed as in the section “Computing the height of the slots,” except that the page area's height [CSS3PAGE] is used instead of the element's height. Similarly, the width of the slots is computed as in the section “Computing the width of the slots,” but with the page area's width replacing the element's width. Note that certain rules in those sections are never applied, because the page area's width and height are always known a-priori and the width and height of slots is always a <length> or ‘*’. For page breaking purposes, each slot is considered as a page and the page break properties on the elements in that slot determine where the content for that slot is broken. Content after the page break is put in the slot of the same name on the next page that has such a slot. If there is no such page the content after the page break is not displayed? displayed in the default slot? Note that an element A that appears later in the document than an element B may thus be displayed on an earlier page than element B, because their respective slots are broken across pages in different ways. Because of limitations of a device (e.g., limited memory), it may be that a UA has to print a page (force page breaks) even though some slots aren't filled yet. This example shows how the first page may have a different layout from the other pages. The slot ‘a’ only occurs on the first page. If the content for that slot (in this case: all H1 elements) is too long, the remaining content of that slot will not be displayed. The slot ‘@’ occurs on normal pages and all its content can thus be displayed by adding additional pages. Note that “page masters” (sequences of different templates for sequences of pages) can be made with the selectors defined in [not yet decided]. Element-based templates in paged media may be broken across pages, subject to the page break properties. In addition to the break points listed in the Paged Media module [CSS3PAGE], a page break may occur between two rows in a template, if there is a possible break point at the same height or higher in all slots that span those two rows; and a page break may occur inside a row if there is a possible break point in all slots in that row. Try to be more precise? If ‘page-break-before’ or ‘page-break-after’ is ‘right’, ‘left’ or ‘always’ on an element inside a slot in an element-based template, the value is treated as ‘auto’ instead. The ‘page’ property does not apply to elements inside a slot of an element-based template. Any other forced page break (see section 5.5 of Paged Media [CSS3PAGE]) causes a new page to be created and all content in the document after this page break will be put in slots on the new page or on later pages: slots on any previous pages will not be further filled. Both page-based and element-based templates can be used in the same document. Here is a page as one might find in a newspaper. It combines a layout template with multicolumn layout. The front page of a newspaper, with the first parts of several stories that are continued on other pages and headings and images that span several columns. If a slot on a page is full and the content continues on the next page, it may be useful to insert something like “continued on page X.” This is useful at any page break, but more important if there are multiple “flows” of content on each page. Maybe a page-break-content property? ‘page-break-content: "▶ continued on p. " targetcounter(?? ?, page)’ or extend text-overflow from [CSS3TEXT]? An element with a computed value of a letter for its ‘position’ is a positioned element (see [CSS3POS]) and thus the ‘z-index’ property applies to it. The general rules for stacking contexts [ref in CSS3?] apply. Note that an element can only have such a computed value if it has an ancestor that is a template element. Rendering of the above example. Page-based floats – In paged media (see [CSS3PAGE]), if the value of ‘float’ specifies that the element floats to the top or bottom of the page (in a horizontal writing mode) or the left or right of the page (in a vertical writing mode), the ‘position’ property doesn't apply. Normal floats – In other cases, the element floats normally within its containing block, which in this case is its slot in the template (as defined above). The Grid Layout Module [CSS3-GRID-LAYOUT] defines a ‘fr’ unit (for “fraction”) that is usable with certain properties that position or size boxes. A template element defines an implicit grid (in the terminology of that module) for use with the ‘fr’ unit. The vertical grid lines are formed by the left and right content edges of the template element and by the edges between the columns of the template. The horizontal grid lines are formed by the top and bottom content edges of the template element and by the edges between the rows of the template. The top content edge and the left content edge have the number 0. In other words, a template with n columns and m rows defines n + 1 vertical grid lines numbered 0 to n and m + 1 horizontal grid lines numbered 0 to m.
the “p1” element will be positioned with its top left corner against the top left corner of slot f. But note that it is not part of the content of slot f, it overlaps with it. Slots must be rectangular, but the appearance of non-rectangular slots can be achieved to a large extent by chaining slots together. Content that is positioned in the first slot of a chain is automatically continued in the second slot if the first slot is full, and then the third, etc. A value of ‘none’ means the element's template has no chains. Otherwise the value consists of one or more comma-separated lists of letters. No letter may appear more than once in the value. Letters that do not occur in the template are ignored, but do not make the value invalid. A list with only ignored letters is itself ignored. All the non-ignored letters in a list, except for the last one, must refer to slots whose size does not depend on their contents, otherwise the list is ignored. The size of a slot does not depend on its content if all the columns and all the rows that the slot spans have a width, respectively height, that is a <length> or ‘*’. Each non-ignored list defines one chain. Each chain is filled with content in an analogous way to the pages in paged media: all the content that is positioned to the first slot in the chain is flowed, in document order, into the first slot in the chain until the slot is full, the rest is flowed into the second slot until it is full, etc. Content must only be split between slots at an allowed page break [CSS3PAGE]. As for page breaks, if a break occurs in the margin between blocks, all adjoining margins are set to zero. Note: It is the author's responsibility to make the height of relevant slots an integral number of lines if he wants to ensure that the lines in chained slots are aligned. The height does not automatically “snap” to a multiple of the line height. The following template creates a double-staircase layout. In case the content is too long for the staircase, a slot of flexible height is added at the bottom. Note: For more anaylysis of the possibilities and limits of non-rectangular slots, see the PhD thesis of César Acebal [ACEBAL2010]. display: "A A A . . ."
"A . A . . ."
"A A A . . ."
". . . B B B"
". . . B . B"
Such cutouts in the middle of text usually create text that is difficult to read, and that is why there is no ‘float: center’, e.g. Note that a slot can have overflowing content even if it is part of a chain: it can have content that is too wide and content that is too tall but cannot be broken. Avoid a break inside (before, after) the generated box. Always force a break before (after) the generated box. A test suite will be developed during the Candidate Recommendation phase of this specification. The following types of use cases were considered for template-based layout. Grids and other table-like layouts. This includes grid layouts, frame layouts and table-like subdivision of a rectangular area. A layout structure with “flex”ing information. The flexing is represented by constraints that specify how the cells are to relate to one another: which cells are to be allowed to grow or shrink and how much. There may also be a priority ordering, which determines, based on the size of the allowed display window, which cells shrink, which grow and under which conditions. 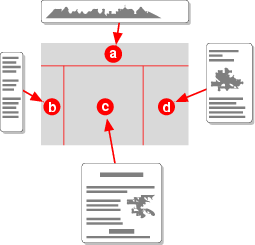 Layout structures with absolutely positioned (fixed-size) elements; for example a block of text into which several illustrations intrude at fixed positions within the block. This is like a float with respect to tightly wrapping the text around the intrusion, but the position of the intrusion is determined by the layout structure, not the content flowed into that structure. An example of this is a multicolumn layout with one or more “absolutely positioned floats” that intrude on the columns (see figure). An image (or a “pull quote”) is placed centered on the page and intrudes on two areas. the physical layout structures – the way of structuring the “cells” (slots) into which content is flowed. This includes a way to identify the various layout containers. the binding mechanism – the way to specify that a given element (and its descendants) are to be placed in a given layout cell. the property distribution mechanism – the way to put properties onto the layout structure and the cells within it. the flexing mechanism – the way to describe how the layout structure should adapt itself to the higher level container (window) in which it is placed. This includes statements about which cells should grow and when they should grow. A character matrix is used to show the layout structure and the cells are named by the character used to show where they are positioned. The binding of content to cells is handled by the ‘position’ property which identifies a cell to which the content is bound. The shape, size and flexibility of the layout are specified with the character matrix. Some properties (background, border and vertical alignment) are attached to individual slots. There is limited “flexing” information. The choice is between fixed size, a fraction of the available size or the content's intrinsic size. (The latter is further subject to min/max sizes specified on that content.) It is not possible to say, e.g., that some column can only become wider if all other columns are at their maximum size. Added the ‘chains’ property to create sequences of slots. Added region-based styling: properties can be set on the part of an element that is inside a slot, different from the part that is in a different slot, using the ‘slot()’ pseudo-element. Added more properties that apply to a slot itself. Digits are now allowed as names for slots (in addition to letters). The ‘gr’ unit is renamed to ‘fr’ (see [CSS3-GRID-LAYOUT]). List items and table elements can now also have templates. Added some more issues and links to the issue tracker. The first ideas for describing a template in CSS date from 1996 and are described in Frame-based layout via Style Sheets by Bert Bos, Dave Raggett and Håkon Wium Lie. The idea was revived in 2005 on the request of W3C's Device Independence Working Group and benefited especially from discussions with Rhys Lewis and Rotan Hanrahan from that group. This specification was further influenced by ideas about form layout by Dave Raggett [member-only link] and an early write-up of the features of XUL by Ian Hickson [member-only link]. Andy Clarke, Jina Bolton and Kevin Lawver provided use cases, examples and requirements. The analysis in the History section is a slightly shortened version of work by Steve Zilles. César Acebal built the first prototype. Andrew Fedoniouk built the second. A third prototype was made by Alexis Deveria. anonymous block of a slot, 6.